Thanks for this model. I made this as a gift for a friend. 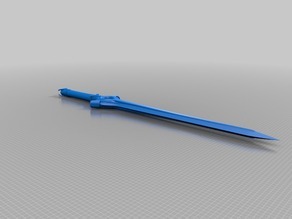 I loaded up the model in Fusion 360 and cut the sword in half (the long way) so that I had a completely flat surface to print from. I then cut it at several points into several parts that would fit on my printer. I also added a 1/4 inch hole that goes through the center of the sword. I cut a 1/4 inch metal rod and slid it through the hole. This made the sword stronger. I used epoxy to glue everything together. For painting I got silver and gold metallic spray paint. I used burgundy for the hilt. I sprayed the silver on, then put tape over the silver and sprayed the gold on, and so on.